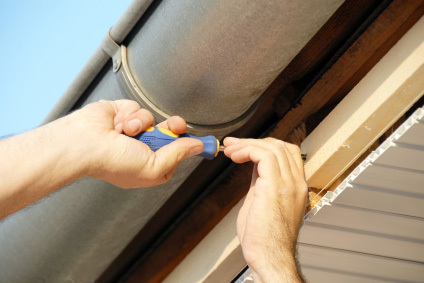 Gutter repair can be required as result of a variety of circumstances. No matter how sound a roof is built or how well it’s insulated, without good gutters, problems are likely to appear over time. Many houses in Denver have problems with their gutters – they are either corroded, leaking, or they fail to properly evacuate the rain water away from the house. Campbell Beard Roofing offers complete Denver gutter repair and Denver gutter replacement services to the residents of the Mile high City and surrounding areas. Homeowners should carefully consider their options when choosing the gutter system for their home. Campbell Beard Roofing offers a variety of systems to cater to any Denver gutter replacement need. The materials used to make the gutters are important – you can choose from galvanized steel, plain steel, copper, or aluminum. Galvanized steel is considered to be the most resistant to the corrosive action of weather elements. If you are looking for a new Denver residential gutter, you can also go for the seamless aluminum gutters, which have the advantage that they are cheaper than the steel models and they do not need painting. Denver residential gutters made of aluminum are less sturdy, however, and can easily be dented or otherwise damaged. You should regularly inspect the condition of your gutters and make any Denver rain gutter repairs as needed. One of the most common problems that requires rain gutter repair in Denver is corrosion. Corrosion cheap cytotec pills appears when water accumulates in certain sections of the gutter for a long time. Rusting can be only superficial or it can penetrate deep into the metal, in which case you should replace the gutters at Denver’s Campbell Beard Roofing. To avoid corrosion damage to your gutters and possibly a complete Denver gutter replacement, you should thoroughly clean the gutters at least twice a year. Remove all the debris that gathered in the gutter, such as leaves and dirt and make sure that the downspouts are clear. If needed, make small Denver rain gutter repairs, such as replacing compromised sections of gutter. Another problem that often requires a rain gutter repair is leaks. Leaks most often appear at the seams and at corners and are caused by bad Denver gutter replacement jobs. Water will flow through the leaks and on the walls, and possibly infiltrate the structure of your house, with long term damaging effects. To help prevent additional damages, Campbell Beard Roofing recommends that Denver gutter leak repairs should be made as soon as possible. The condition of downspouts is another thing to be considered in relation to gutter repair in Denver. Downspouts should be waterproof and should take the water stream away from the home, to prevent infiltration to the foundation. In Denver, gutter replacement should be done when the downspouts are severely corroded or when they are leaking water at the seams.